For the first time the cafe will be set up in the lobby of Lincoln Center's famed Avery Fisher Hall. And "fashion-inspired dishes" from the likes of Mario Batali, Daniel Boloud, Thomas Keller, and Emeril among others. Personally, I'm especially looking forward to trying the dessert menu which includes Cowboy Cookie with Oatmeal, Pretzels and Chocolate Chunks Pumpkin Whoopie Pie from Baked; Christina Tosi's Chocolate Chip Cake Truffles and Blueberry and Cream Cookie; and Michael Laiskonis' Bacon Brittle and Double Chocolate Cookies. Not to mention the introduction of a breakfast menu. Can't wait for this weekend! 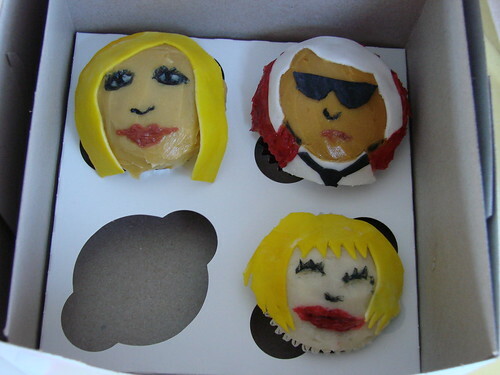 *Fashionistas Donatella Versace, Karl Lagerfeld, and Betsey Johnson are featured in the above cupcakes, that I created this summer for the launch of The Gloss. Check out their side for a gallery with close ups of each of the designers in their fully frosted glory.